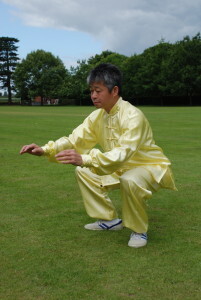 When we are practising our Qigong, if we find that we are breathing faster than usual what does this mean? Usually this happens when we are doing Horse Stance or other standing positions that do not involve moving. During movement we usually breathe according to the movement however with standing positions there is obviously no movement. So whilst doing something like Horse Stance if our breathing is fast this means our body is weak in that position. A low Horse Stance is very physical and it demands more Qi to flow along channels and this is the same as the blood circulation. If we are not strong enough to keep all the Qi flowing quickly then we need to bring more air into body. Why do we not say “Air into the lungs”? Senior Qigong practitioners whose level is much higher do not just bring air into the lungs. We also absorb the air through the acupuncture points and skin, and so every part of the body. Of course it takes years of practise to reach this level. When our breathing changes from fast to slow it means the internal body is strong enough to balance the strong physical position and also our channels and acupuncture points are more open. This means we are stronger and healthy.